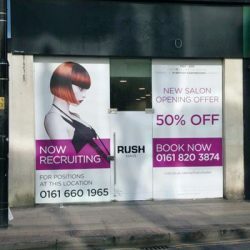 RUSH’s second flagship salon is arriving in Manchester. On Saturday 1st October, RUSH Manchester will be open for business at 69 Deansgate, Manchester, M3 2BW. The second flagship is in the heart of the city centre and is located between department stores and trendy bars. The iconic Old Trafford Stadium is just one of many top attractions nearby. Inside the salon, you will find a shiny modern interior and a luxurious retail range. Whether you’re looking to refresh your hair with some colour or have a bouncy blow-dry, RUSH brings you beautiful hair at affordable prices. More importantly, each and every one of our talented stylists will make you feel at home. Book your appointment today at RUSH Manchester to take advantage of our new salon offer. Want to know what booking software RUSH salons use?